Overall comment: Pretty delightful desserts! Whimsical-like cakes, crepes & more to end (or even begin!) your meal on a positive tone ;) They've just started serving main courses as well, so they're still in the process of improvement & adjustments to ensure that their entire menu gets thumbs-up. There are currently 2 outlets in Klang Valley i.e. one in Kota Damansara & another in Avenue-K, Jalan Ampang. It was indeed a privilege to taste & provide feedback on the items on the menu served to us on that day at the Avenue-K outlet :) Big thank you to NomsterAd + Tokyo Pastry for the opportunity! For those who love the taste of green tea, you would probably prefer this to the cucumber latte. The ice-blended was unfortunately slightly 'thin' (I was expecting a smoothie/shake-like texture + loads of finely crushed ice) & lacks sweetness. I would prefer it to have more milk, green tea, a tad more sugar syrup & crushed ice ;) Yes, this is coming from someone who doesn't like sweet stuff! Among all the 4 drinks served to us that day, this was probably the most pleasing to the palette. It's nothing very fanciful & a rather familiar taste, but at least it tasted 'right'. Just like the ice-blended matcha, this Oreo variant could do with more milk, Oreos & crushed ice as well. This was our next favorite! I especially love the chewy mochi pieces (those pink, green & white colored cubes) accompanying the cool matcha ice-cream, soft-boiled red beans & the fragrant crepe. The crepe could be further improved as I think it could still be slightly 'thinner'. It's overall a 'fun' dessert to enjoy! Basically, what I REALLY appreciate about this Yamaimo is that the 'strands' + cream between the layers of cake aren't "yam-flavored cream" but are ACTUAL mashed yam! I LOVE the authenticity! *thumbs up* Lovely mix of texture; the smooth mashed yam + the cool, moist white cake. Yums! The mille crepe fell short of flavor. It needed more Oreos in the cream itself instead of just having cream between the layers of crepe with crushed Oreos as a topping. The mini macaron cake is a pretty sight, no doubt. Flavor wise, it could be improved. The macaron was slightly dry & 'wafer-y'. It didn't have a distinctive strawberry taste as well unlike macarons from say TWG (I haven't tasted many macarons to make a good comparison). The chocolate & vanilla cream was quite nice, but the overall experience of the mini macaron cake would be much nicer if the macaron is actually slightly chewy & soft on the inside. You've seen some of the desserts available, but do you know that Tokyo Pastry now serves mains & appetizers as well? Ahah. Tokyo Pastry is coming up with a "complete" menu to offer their dessert-lovers a proper meal before indulging into the delicious desserts! Fresh mushrooms cooked to perfection with porcini oil. Taste the aromatic mushroom goodness in every sip. I felt that the soup could be thicker & more creamy, but it's not too bad for a mushroom soup. The porcini oil actually elevated the simple mushroom soup's taste & fragrance to the next level. Satisfy your craving for the ocean with this rich creamy soup of salmon complemented with carrots and celery. I didn't really fancy this version of the salmon chowder. Somehow a "chowder" to me should be more 'chunky' & 'rich', but this one was slightly watered down. The chefs fried the salmon first, so the soup was slightly more "fishy". There were bits of fried salmon in the soup, but I would much prefer to have flakes/chunks (cubes) of salmon flesh itself, just like how it's served at the Utara Coffee House in Armada Hotel. The cream of salmon there is really commendable although it's double the price! I must say that the mango lime salsa was quite refreshing & make this dish a good appetizer. However, because the salad is served with smoked salmon instead of fresh salmon slices, the salmon slices were on the savoury side, which caused an imbalance of flavours in the simple salad. Kinda expensive too for such a small portion...haha. Much to our surprise, this simple pan-seared chicken was actually the best among all the mains served for our tasting session! The part of this dish that made this dish a champ was actually the sauce/gravy. It was a well-balanced taste of sweet & savory, plus it has the fragrance of the truffles. Well done, Tokyo Pastry! I'm rather particular when it comes to salmon. I love my pan-seared salmon to have a nice, crispy skin with juicy/moist flesh of the salmon beneath the crisp. This was somewhat overdone as the fish was dry. The Kikkoman soy sauce gravy didn't really help as it's a savory sauce that could over-power the originality of the salmon. Hmm...I found this a tad too sweet for my liking although I really appreciated the evident presence of fresh basil in the tomato-based sauce. No complains for the prawns & baby octopus. I just feel that salt could balance up the dish more than sugar. After tasting the variety of drinks, desserts, appetizers & mains, I would still say that Tokyo Pastry is living up to its name as a pastry house. Given more time, hard-work & passion, Tokyo Pastry could be the next place for a complete & scrumptious meal - a place where the young & old would want to hang-out for good ambiance, delicious food & comforting/refreshing drinks. Overall comment: Delicious fresh Norwegian Salmon cooked to perfection in various styles. If you're a fan of salmon, you'll really enjoy the variety offered (plus it's at affordable prices)! 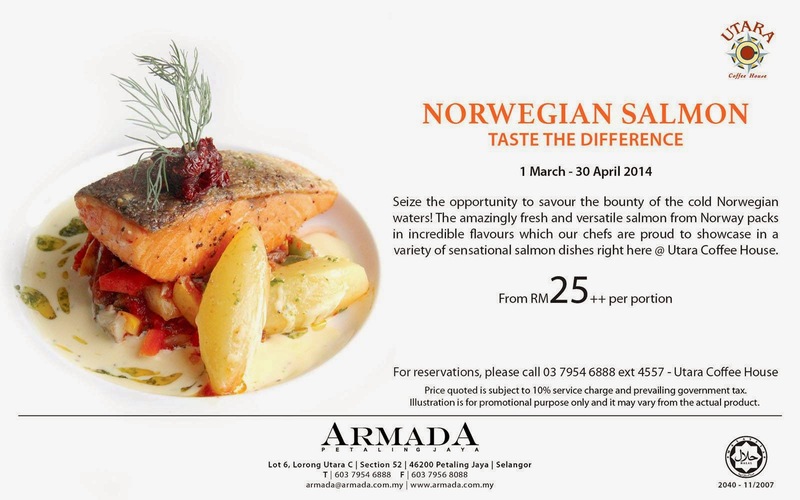 Throughout the entire months of March & April 2014, be spoilt for choice with Utara Coffee House's Norwegian Salmon Promotion! There are 8 different dishes to choose from, with prices starting from RM25.00++/serving. Affordable for a salmon dish, right? I was pleasantly surprised when I took my first mouthful of this 'cream of salmon'. "Where's the strong, fishy salmon taste??" I was seriously expecting that. But Chef Chew wisely commented that by slow-boiling the head & bones of the salmon & not "over-boiling" it, you'll never get the fishy smell! Oooh...I learned something new that evening. I love the fact that 1) there's no fishy smell & taste in the soup, 2) the salmon pieces are in nice "dices" & not flaky/broken in millions of pieces (the trick is to poach it before adding it to the soup! )...loads of salmon in the soup as well, 3) there are diced carrots, leeks & celery for some variety of texture & bite, & 4) there's a generous piece of fragrantly "buttered & herbed" toasted baguette to go with the soup!! Oh my goodness...such comfort food! It's a good meal by itself for those who are not keen on having too heavy a meal. Oh yes, the shitake mushrooms are apparently in the soup. Hmm...it needs to be more "evident", I feel. Spoonful of salmon & vegetables! Interesting! This is one homey-comfort food on a long, tired workday. It's not exactly the most "slimming" of the variety since it is creamy & cheesy, but it certainly is VERY comforting...hahaha...the baked salmon was nicely cooked (not over-cooked & dry), plus the zucchini, capsicums & mushrooms gave a good variety of texture to this rather cloying dish :) The lemon juice surely helps to take some of the cloying feel away. I had mixed feelings for this dish. I enjoyed the cheesy, baked oyster gratin, but somehow I didn't enjoy the salmon as much. The salmon was actually stuffed with spinach & cheese. It's then rolled & poached before serving on a bed of more cheese + spinach mash & some prawn 'bisque'. I found the flavours slightly clashing, so you could opt for other sauces like the fruity orange or the lemon sauce to go with the piece of salmon instead of the somewhat "pungent" prawn 'bisque'. This dish was quite pleasing to the palette :) Being a fan of Mexican flavours, I enjoyed the combination of ingredients that the Utara Coffee House placed together in this dish. You'll get a good portion of salmon chunks, capsicums, jalapenos, tomatoes, & cheese all in the little pockets of tostadas! The best part of this dish, in my opinion are the dips. I especially love the fresh guacamole & tomato salsa...ah, I need to head back to the States again for my fix of good Mexican food!! One of the bloggers probably had an "orgasmic" experience when he had this cos he was SO in love with this salmon dish that he kept praising it for the entire 10 minutes or so...yes, on this ONE dish! The combination of flavours are very similar to the oyster gratin dish, but this one didn't have the oyster on the plate. I have to say that the 'gratin' part of the salmon was very flavourful, creamy, & silky-smooth. Well executed, chef!